Japan’s All Nippon Airways (ANA) will gain a strategic foothold in Myanmar, one of Asia’s most dynamic and fastest growing markets, following an unusual move to acquire a 49% stake in Asian Wings Airways (AWA). Asian Wings is a small little known domestic carrier, but with financial and management support from ANA could quickly become Myanmar’s largest international airline. The ANA-AWA surprising partnership is significant as it marks ANA’s first investment in a carrier outside Japan and marks the first overseas investment in any Myanmar carrier. In both cases it will likely not be the only example for long. ANA is looking to acquire stakes in several Asian carriers as part of its new strategy aimed at diversifying the group’s portfolio. Meanwhile, other Myanmar carriers are looking to secure potential investment from foreign airline groups, including LCC groups. Several Southeast Asian LCCs have been looking at establishing a joint venture or affiliate in Myanmar while the country’s other full-service carriers could also attract interest. Asian Wings launched services in early 2011 with an initial fleet of two second-hand ATR 72 turboprops. It acquired a used A321 in late 2012 with the intention of expanding into the international market. The privately-owned carrier has since been slow to pursue international expansion but it is now finally preparing to launch international services with support from ANA. In a 27-Aug-2013 statement announcing the planned acquisition of a 49% stake in AWA for USD25 million, the ANA Group stated that AWA plans to launch international services in Oct-2013 and has a goal of expanding its fleet to 10 A320 family aircraft by 2018. ANA stated that it “will also work with AWA to improve its operational and on-time performance and support its expansion into markets outside Myanmar”. The deal is subject to approval from Myanmar authorities and the signing of a final agreement between the two companies. Myanmar’s international market has huge opportunities as it remains relatively under-served despite a huge influx of capacity since Apr-2012, when Aung San Suu Kyi’s National League for Democracy won landmark elections and economic sanctions started to be lifted. 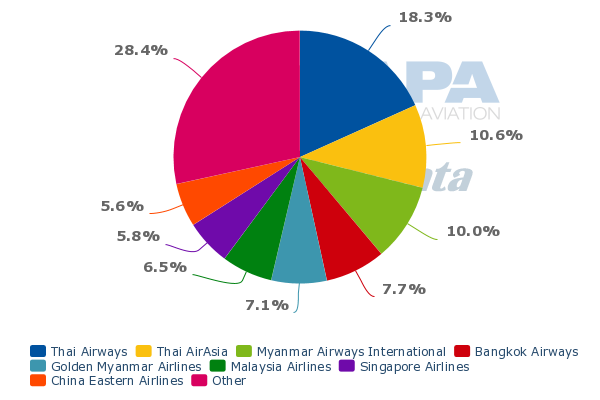 11 foreign airlines have launched services to Myanmar over the last year while nearly all of the carriers that already served the market before Myanmar opened up have added capacity. Local carriers, however, primarily remain focused on the domestic market. Only two of Myanmar’s eight carriers currently operate international services, flag carrier Myanmar Airways International (MAI) and LCC start-up Golden Myanmar. The two carriers currently only account for about 17% of capacity in Myanmar’s total international market. MAI serves five international and one domestic route with A319s/A320s and currently offers only about 7,000 international weekly seats, making it the smallest flag carrier in Southeast Asia. Golden Myanmar serves two international and one domestic route with A320s and currently offers about 5,000 international weekly seats. A tie-up with ANA instantly gives AWA a competitive advantage as it prepares to enter the international market. ANA will help AWA with marketing overseas, which is important as Myanmar is primarily an inbound market. Financial support from a company such as ANA is also crucial as launching international routes can be an expensive and risky proposition. But international expansion will be challenging even with help from a leading foreign carrier such as ANA. Myanmar’s main international routes have become very competitive as several carriers have added capacity in anticipation of rising demand. Myanmar’s international market grew by 33% in 2012 to just over 2 million passengers, including about 1.9 million passengers at Yangon and 78,000 at Mandalay. The domestic market also grew by 16% to over 3.5 million in 2012. Similar growth figures are expected for 2013. There has been a noticeable increase in demand for services to, from and within Myanmar, driven by a surge in visitor numbers and increasing business traffic as multinationals look to set up in Myanmar. But the tourist market is seasonal and there is a shortage of hotels, particularly during peak periods, which will take some time to resolve as hotels can not be built as quickly as airlines can add capacity. Myanmar’s international market will surpass 100,000 weekly seats for the first time in Dec-2013, according to CAPA and Innovata data. The approximately 101,000 weekly seats in Jan-2014 will represent 25% year-over-year growth compared to Jan-2013. This does not match the roughly 60% growth seen the previous winter but shows while Myanmar is cooling down it remains one of Asia’s fastest growing markets. Thai budget carrier Nok Air is launching three routes to Myanmar over the next couple of months. Nok will initially offer Saab 340 turboprop service from Mae Sot in northwest Thailand to Mawlamyine from 3-Sep-2013, followed by Saab 340 service from Mae Sot to Yangon on 1-Oct-2013 and 737-800 service from Bangkok to Yangon on 1-Nov-2013. Nok and Tigerair will be the 10th and 11th airlines to launch services to Myanmar since mid-2012 (although two of these 11 airlines, Condor and EVA have since dropped their Myanmar services). Nok and Tigerair will give the Myanmar market service from 21 foreign carriers. Note: based on capacity for weeks commencing 6-Jan-2014, 2-Sep-2013, 14-Jan-2013 and 16-Apr-2012. ANA or AWA have not identified initial routes to be operated but Bangkok, Kuala Lumpur and Singapore would be logical as these are the three largest markets from Myanmar. Outbound Myanmar traffic is particularly focused in these markets. Bangkok and Singapore, however, are already served by both MAI and Golden Myanmar while MAI also serves Kuala Lumpur. Bangkok, Singapore and Kuala Lumpur are also the initial three international destinations targeted by planned Myanmar-based start-up carrier Apex Airlines. The Bangkok and Singapore markets also have seen an influx in capacity from Thai and Singaporean carriers. Once Tigerair enters the Yangon-Singapore market in early Oct-2013, the route will have about 8,700 weekly one-way seats, an increase of about 67% compared to early Oct-2012. The Yangon-Bangkok market will have about 20,000 weekly one way seats in Jan-2014, an increase of about 35% compared with Jan-2013 and about 79% compared to Jan-2012. AWA could look to differentiate itself by targeting North Asia, which is not served by MAI or Golden Myanmar with the exception of MAI’s Yangon-Guangzhou service. ANA could help AWA open routes to markets such as China, where ANA has a strong presence. But local demand is relatively limited and most North Asian carriers have launched services to Myanmar relying heavily on transit traffic. South Asia could also be an option for AWA as Myanmar-India is a small but fast-growing market. Unlike markets in Southeast Asia, ANA could potentially use AWA to serve South Asia. ANA launched services in late 2012 to Delhi, the carrier’s second market in India after Mumbai. As CAPA previously reported, ANA is seeking to expand its presence in other Indian cities but does not believe other markets can support non-stop service from Tokyo. ANA has been looking at working with Star partners to serve other markets in India. Working with AWA on potential Myanmar-India routes would be another option. The Myanmar-India market is currently served by MAI and Air India with services to Gaya, a popular Buddhist pilgrimage site in eastern India. (The MAI service to Gaya is seasonal.) All potential Myanmar-India routes are well within narrowbody range as India is a neighbouring country. The benefits and synergies that AWA bring ANA are not at all obvious. ANA will be able to increase its presence in Myanmar but Myanmar is a small market and is unlikely to be a major market for ANA even as Myanmar continues to emerge and grow. ANA will not be able to use Yangon as a hub for Southeast Asia given Yangon's position in the far western portion of Southeast Asia. Only South Asia could be potentially served via Yangon but with the exception of some opportunities in the India market, there is limited potential for growth in South Asia for a Japanese carrier. Bangladesh, Pakistan, Sri Lanka, Nepal and Bhutan could easily be served via Yangon but there is limited demand for these markets from both Myanmar and Japan. ANA launched services to Yangon in Oct-2012 using its all-premium 737-700ERs. The carrier typically uses its two 737 Business Jets, which are currently configured with 24 business and 10 premium economy seats, to test out new medium-haul markets. 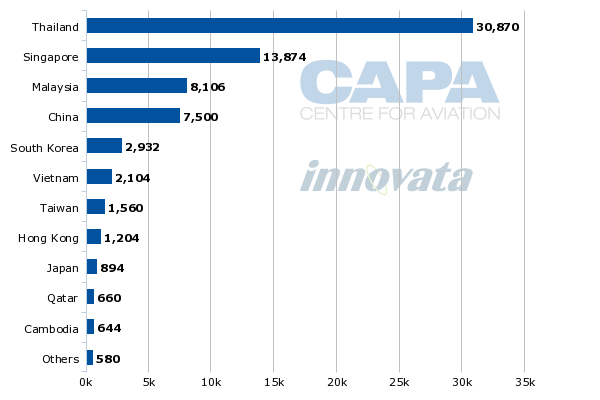 CAPA initially reported in Jun-2013 that ANA was looking to up-gauge its Yangon service to 767s or 787s. The carrier formally announced on 24-Jul-2013 plans to increase Tokyo-Yangon starting 30-Sep-2013 from three weekly 737-700ER ANA Business Jet flights to daily 767-300ER flights with 35 business and 167 economy class seats. ANA now also expects to start working with AWA to offer domestic connections at Yangon after it transitions Tokyo-Yangon to widebody service. AWA currently serves 13 domestic destinations using its fleet of two ATR 72s and one A321. ANA will have an advantage over other foreign carriers as it will be able to offer domestic connections in Myanmar, which is particularly important for tourist traffic, as there is limited surface infrastructure. While Yangon is the main business destination, tourists typically combine Yangon with Bagan and Mandalay in northern Myanmar. Foreign carriers serving Myanmar will likely look to partner with some of the country’s carriers. Star Alliance carriers serving Yangon could look to partner with AWA, which could eventually join ANA in Star if it succeeds at international expansion. Airlines from other alliances could look to partner with other Myanmar carriers. Korean Air already began codesharing with MAI in early 2013. MAI currently only codeshares with two carriers, Korean Air and Jetstar. There are currently no other examples of Myanmar carriers codesharing with carriers from outside the country. Other Myanmar carriers could also look to forge similar equity tie-ups. Generally Asian full-service airline groups are not interested in investing in other carriers. If such investments did occur it would likely be from airline groups in Thailand, Singapore or Malaysia as the economic ties between these countries and Myanmar are strong. Southeast Asia’s LCCs are more likely than the region’s FSC groups to make a move as all of the LCC groups have a strategy of expanding into new markets by acquiring or establishing new affiliates in partnership with local investors. AirAsia, Jetstar, Lion, Tigerair and VietJet have all looked at Myanmar since the market opened up. At least one of these LCC groups will likely make a move in Myanmar over the next year. AirAsia already has affiliates in four Southeast Asian countries; Tigerair in three; Lion in two with a third in process; Jetstar in two; and VietJet in just one but has a second in process. Myanmar is the only major Southeast Asian market that currently does not have an affiliate from any of these groups. It is an obvious white spot with huge opportunities as the country’s LCC penetration rate is currently less than 20%. LCC groups could potentially invest in Golden Myanmar, which for now remains independent but like other privately owned Myanmar carriers is open to foreign investment. With AWA selling a stake to ANA, other Myanmar carriers may be pressed to look harder for potential international partners. LCC groups could also potentially establish a new carrier in Myanmar with local partners. There are four companies now in the process of establishing new airlines in Myanmar. Some could end up launching as an LCC in partnership with foreign LCC groups. Of the four start-ups recently identified by Myanmar authorities as having submitted applications for new scheduled airlines, one, FMI, already operates charters using a fleet of ATR 42s and Beechraft 1900D turboprops. Another proposed start-up, Apex Airlines, has already launched a website and listed initial domestic and international destinations. But Apex, which plans to follow a hybrid carrier model and be based at the capital Nay Pyi Taw, has not yet started sales. The other two new potential start-ups, Yadanabon and Saga, have not yet launched websites. It is unlikely all four proposed start-ups will launch. With eight carriers already in the market, consolidation is likely even as the market grows rapidly. The AWA-ANA deal could speed up a potential consolidation process assuming AWA emerges as a stronger competitor, prompting other airlines to consider local mergers and acquisitions while also looking to secure foreign investors. For ANA, the investment undoubtedly ranks high in risk terms. The country is still politically unstable, infrastructure is limited and there is already considerable competition. But the amount involved is only pocket change for ANA as the group has one of the largest cash positions in the global airline industry. This is just the first and smallest step in a new strategy for ANA to diversify into new growth areas with a focus on airline-related businesses in Asia. Other bigger investments will likely follow. This could just be a test for ANA to see how investments in other airlines can be pursued. Despite Myanmar's fairly liberal approach to aviation expansion, there is little government experience in managing the industry and it will be important, not only for ANA and AWA but also for those who follow, to establish a consistent and predictable regulatory environment. Like it or not, ANA will be in the spotlight in this respect. As similar stakes in other Myanmar airlines could potentially be purchased for similarly small prices at this formative stage, airlines from across Asia will be closely monitoring ANA’s groundbreaking strategy for penetrating the market. This opportunistic move with only a USD25 million investment could however reap substantial dividends if AWA with ANA’s help is able to position itself as the leading international carrier in Myanmar. AWA is now tiny but it is already profitable, according to ANA, with an annual revenue stream of about USD18 million and 350 employees. The upside from what is still a tiny - and already very competitive - market is potentially very large, as Myanmar has quickly emerged as one of the fastest growing markets in Asia.